You want these, don't you? Admit it. You know you want them. 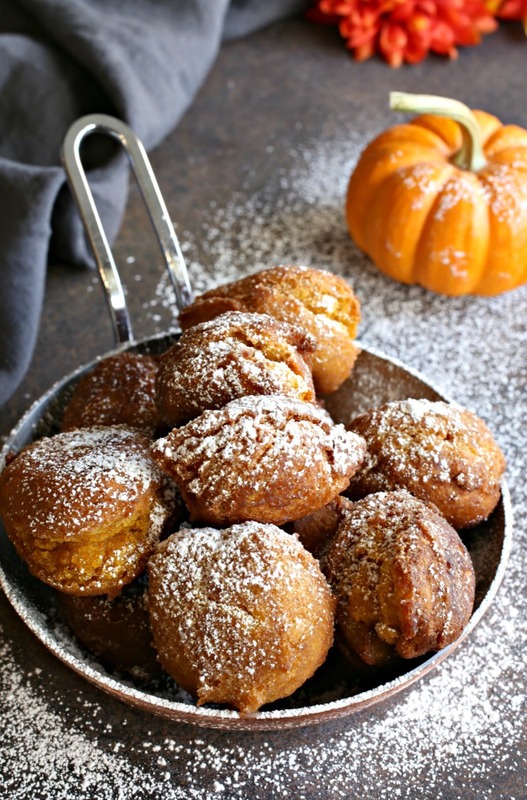 Hot, fried balls of sweet pumpkin flavored dough. 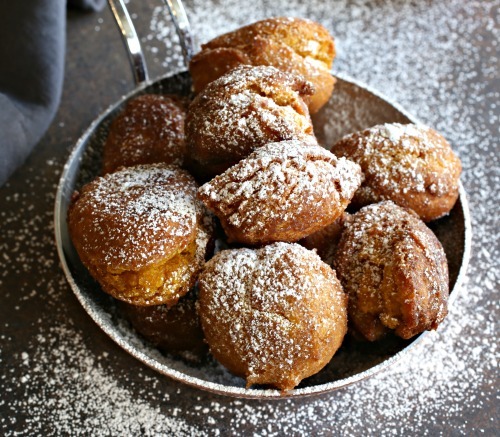 Just a touch of spice, without overwhelming you, and tossed with glorious powdered sugar. It's everything we love about summer street fair food but at home, autumn style. I'm not a big deep fryer at home and am much more likely to experiment with baked doughnuts or bake a batch of scones. But sometimes you just have to plunk some dough in hot oil because there's nothing else quite like it. Picture a cool fall weekend, browsing the farmer's market, maybe going apple picking, and then coming home to a batch of these treats. Now you really want them, don't you? 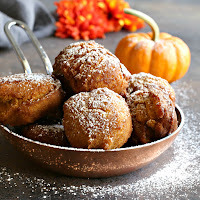 OK, even if we didn't quite have the picture perfect, autumn hayride weekend kind of experience, we can still make these because they're easy, quick and completely satisfying. I won't tell you they're light but I will say they'll disappear fast. Enjoy! 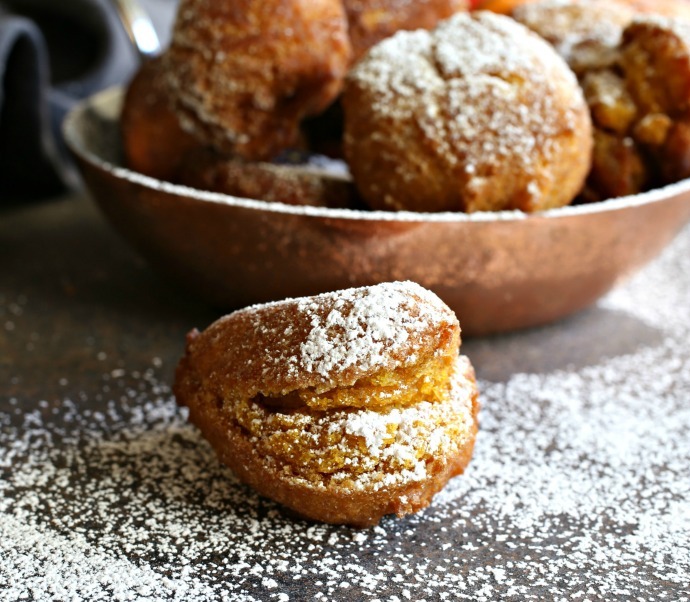 In a large bowl, whisk together the egg, sugar, vanilla and pumpkin puree. Sift together the flour, salt, cinnamon, ginger and nutmeg and stir the dry ingredients into the wet. Add a couple of inches of oil to a pot or large skillet and bring the temperature to 350 degrees. Drop the batter into the oil using a big spoon or 1 oz. scoop. Work in 2 or 3 batches so as not to overcrowd the oil and reduce the temperature. Fry for a couple of minutes on each side or until the fritters are golden brown. Remove from the oil with a slotted spoon and place on a paper towel to drain. Dust with powdered sugar. I wonder if this recipe is correct? Is the One egg enough to let them rise as there is no baking powder listed for this recipe? Hi Rita, the fritters are deep fried, not baked so the one egg is enough leavening.